Choosing your life partner — the person you want to spend the rest of your days with — is one of the most important decisions you'll make in your life. Living most of your life with the person you love can be a joyous, mutually-fulfilling experience, but finding and choosing the right person can be a monumental task. Sometimes we feel loved to a person who is against in our religion. In this case, what can you say about it? For example in Christian and Catholic relationships and so on, do agree with it? Why? 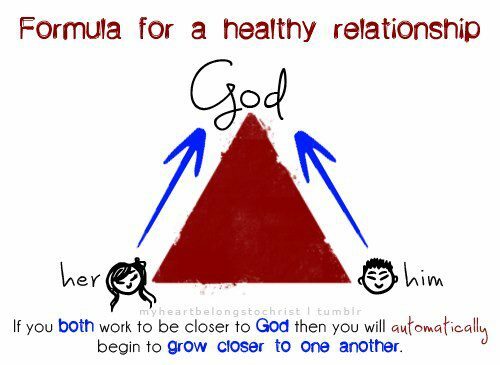 as simple as this ,a relationship that lasts is one with Christ in the center. Two people putting God first, seeking Him in every way possible, in order to be as good as a spouse as one can be. its about trusting one another and trusting in God's plan, that He will build your relationship into one that will last a LIFETIME. I am Catholic and I agree to Chiristian and non-Christian relationships. For me religion doesnt matter when it comes to choosing your life time partner, your love and trust to your partner is not measured by what religion you have. What is important is both of you know who is God and both of you have fear in God. As long as you have faith in Him and He is the center of your relationship I believe that your relationship will be strong no matter what happens. Care and love your partner like how you care and love for God! For me, with love, there is no restrictions as long as the couple are happy and contented with each other. And with God as the center, their relationship will last with no doubt. Admin wrote: Choosing your life partner — the person you want to spend the rest of your days with — is one of the most important decisions you'll make in your life. Living most of your life with the person you love can be a joyous, mutually-fulfilling experience, but finding and choosing the right person can be a monumental task. Sometimes we feel loved to a person who is against in our religion. In this case, what can you say about it? For example in Christian and Catholic relationships do agree with it? Why? It depends on the person and his capability to handle his/her relationship with the person they loved. The important is they loved each and no matter what happens they will not surrender against all odds. Does religious affiliate really matters in a relationship? I think it is not because as long as you love each other and there is God in your life, it wouldn't be bad at all. Partnership doesn't require any religion. If you truly love a person you should know how to fight for him or her. What is required in a relationship is an eternal love for each other. I think it's give in take. Ask your partner if he/she is willing to be converted. Also, put yourself into his/her position and ask yourself if you are willing to be converted to his/her. If you both agree then it's time for both of you what to decide. Or maybe you might want trying each other's churches to decide. For me, Religion doesn't matter at all.. It's a matter of faith in God and as long as you and your partner puts God in the center of your relationship. God will always guide your relationship wit your partner. Before you get involved to each other you must know first their background, if you know that there's a conflict between you and your partner you must talk to each other. Everything will settle if there's a good communication, respect and harmony between you and your partner. i just want to know what is the feeling when you are in relationship? is it hard? Sanel wrote: i just want to know what is the feeling when you are in relationship? is it hard? Sanel. Ah, so for as what I experienced, being in a relationship is both beneficial and sacrificial. It is a give and take responsibility between the both of you. If your religion is far different from your someone .. It will be more complicated. One needs to sacrifice. in my opinion, religion doesn't really matter. There is only one God above us all. In that case, as long as you truly love each other and you have Gods guidance in your relationship that's all that matters. Krysyl Says wrote: as simple as this ,a relationship that lasts is one with Christ in the center. flylanie wrote: Care and love your partner like how you care and love for God! tifalockhart wrote: And with God as the center, their relationship will last with no doubt. Love includes sacrifices, either one of you may sacrifice his or her beliefs for their love. It is not about the religion, you must deal about faith in God that will never affect you and your love one. For me it is a matter of choice. In my case , as a Catholic. I think religion is not a big factor about relationship issues. As long as you love each other and you make your final decision even though you have a different religion or your families are against to your relationship with your love one, stand and fight for it. But don't forget to ask the help and guidance of our Almighty God for you to have a happy and peaceful life with your beloved partner. I don't know if I'm going to agree with this kind of a situation but I guess it depends on the two person which are involved. For me, it is not all about the religion. It is all about the faith that we have especially for our Father in Heaven. As I have said, it depends if God will be their center and if they are going to rely on their religion. In choosing your lifetime partner, for me having a Christian partner is the best. Because if he/she loves Christ he/she can love you as he/she loves God and of course, a Christ centered relationship lasts forever. Religions never been a very big role when it came to dating. It really depends on the person. If both people in the relationship aren’t concerned about the other’s religion, then it should work. However, typically they are concerned (even if they say the don’t, they probably do subconsciously). Then it becomes an issue and an annoyance.